Here’s a good reason to invest in (and actually use) a scale: According to the National Weight Control Registry, 75 percent of people who successfully lose weight (and keep it off) weigh themselves at least once per week. A 2012 study published in the Journal of Nutrition and Dietetics agrees, concluding that people who lose weight are less likely to regain it if they weigh themselves regularly. That’s because stepping on the scale provides people with a sense of accountability, and allows for a change in direction if the current weight-loss plan isn’t cutting it. Little of this results in actual weight gain, i.e., the accumulation of fat—this is extra weight from fluids and foods consumed over the course of the last day or so. “Real weight gain has a lag effect,” Hunnes emphasizes. “If you’re overeating for weeks, that will reflect on the scale as an uptrend in weight over time.” So, if the scale says you gained five pounds directly after a single night of drinking and eating yourself stupid, don’t chuck it out the window—it’s mostly just water (or beer) weight that your body will shed over the next 24 hours or so. 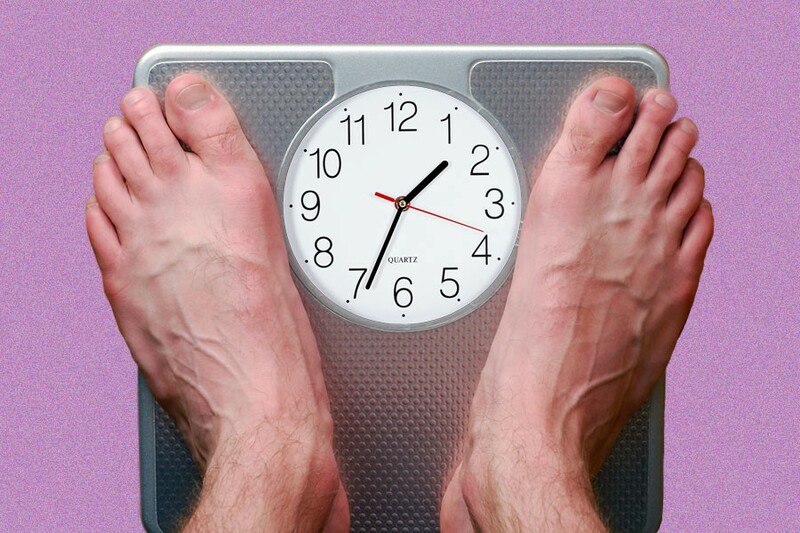 This being the case, though, when is the best time of day to weigh yourself? “First thing after waking up and using the restroom,” says Hunnes, adding that it’s also important to avoid eating or drinking before stepping on the scale. “You haven’t had a chance to lose weight via sweat, or to put on water weight,” she says. As a result, you’ll see a lower number that’s a more accurate reflection of your actual weight, without the extra pounds added by breakfast. The idea here is that you should be tracking your average (but actual) weight over a long period of time—not focusing on the minor day-to-day differences. It also helps to ensure that your scale is on a hard, flat surface—carpets are a big no-no—and that you’re standing with your weight evenly distributed across both feet. Or in the case of your waistband, outward.